Few things are more fun to photograph than fireworks, which is probably why it is the most commonly photographed night scene. 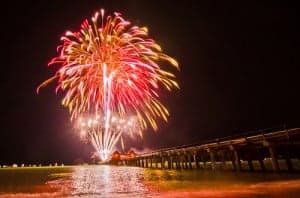 Most photographers never venture out into the world of night photography, but anyone who owns a camera has shot pictures of fireworks at some point in their life.. For that very reason, you might think that it's all been done before; however, in this chapter you’ll learn creative ways to make your night images of fireworks more compelling. Tip #1: Don't shoot the fireworks. Shoot people watching fireworks with the glow of the colorful lights on their faces and the tiny fireworks in the background. The light from the fireworks creates a beautiful mood on the people and will remind you of the outing and your family and friends who were with you. Tip #2: Find something reflective and use it to show the reflection of the fireworks on the water, on the windows of a skyscraper, on someone's sunglasses, etc. Remember, objects show clearer reflections when you are closer to the same plane as the reflective surface. For example, taking a photo down low close to the water will show a brighter reflection than taking the same photo standing high above the water. Get as close to the angle of the plane of the reflective surface as possible for maximum reflectivity. Tip #3: Choose a longer exposure. Fireworks are beautiful because of the anticipation of seeing them explode. A long exposure will show the streak of the firework shooting up as well as the colorful explosion all in the same frame. This makes more of a story. It usually takes approximately 7 seconds for a firework to shoot up, explode, and entirely dissipate, so set your shutter speed accordingly if you only want one burst in the frame. Tip #4: Don't skimp too much on your ISO. While you want to choose a low ISO to mitigate the noise in the image, you want to use as high of an ISO as you dare in order to make the light bursts of the fireworks a bit brighter. Tip #5: Just because you have beautiful fireworks as a subject doesn't mean you can throw composition out the window. Almost all landscape photographs look best with something in the foreground, something in the mid-ground, and something in the background. For example, you could photograph someone sitting on the grass with the glow of the fireworks lights on them, with the lake in front of you, and the fireworks in the background. Following this compositional tip will give the viewer a sense of place–like he or she is really there. Tip #6: Use HIGH PASS sharpening. Most of your images should be sharpened in Photoshop to bring out the crispness of the photo. Sharpening has two purposes: (1) bring out the fine details in the photo such as the weave on someone's shirt, and (2) make edges more crisp to give dimensionality and sharpness to the photo. When shooting fireworks, there really isn't any fine detail to be brought it since the burst of the fireworks will be one plain color without texture. What you want to use sharpening for is to make the edges of the fireworks burst be totally sharp. The drawback to sharpening is that it makes the photo grainier. By using High Pass Sharpening, Photoshop will only target the edges of the fireworks and will not make the plain sky in the background any grainier. Other types of sharpening will not do this as well. For more on high pass sharpening, read this article. Tip #7: If you throw tip #5 out the window and don't have anything in the foreground, you can use extremely low aperture values to get the maximum amount of light on the camera sensor and increase the brightness of the firework bursts. When you focus on a point far enough away from you, depth of field is set to infinity and it really doesn't matter what your aperture is (except for sharpness). Tip #8: Don't forget to set up shooting down-wind. If you sit downwind of the fireworks, the smoke will block your view after a while and you'll have hazy shots. Tip #9: If you want to take a photo of multiple firework bursts in the same shot, but keeping the shutter open too long makes the landscape too bright, you can bring a piece of black paper with you. Put it in front of the lens hood and block all of the light between bursts of fireworks. Because the piece of paper is black, it won't be seen in the photograph since no light is recorded on the sensor when it sees pure black. 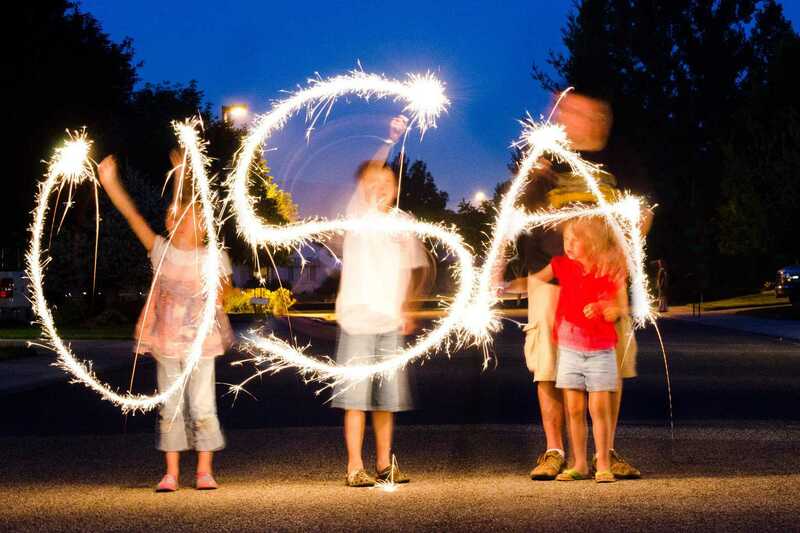 Tip #10: Many people are unsure of exposure settings for fireworks. There's no “right” answer because conditions vary so much, but I'll give you a recipe for a beautiful shot in many conditions: f/16, 15 second shutter speed, ISO 200. If you use those settings on a reasonably dark night and during an average-paced part of the show (the finale usually has so many fireworks that you have to use a faster shutter speed or you have way too much light), you'll get great results. Remember to put something–anything–in the foreground to make use of the increased depth-of-field from the high aperture. Tip #11: Get creative with sparklers. I made this picture below last year at a family Fourth of July party. To do a picture like this, (1) Set the camera on a tripod, (2) Choose f/8, ISO100, and set the shutter speed to 15 seconds (15″). Then press the shutter button and have the people move their sparklers in the shape of whatever word you want to spell. If they don't move their heads, they won't be blurry, but it was tough to get the kids to be still. Fun!